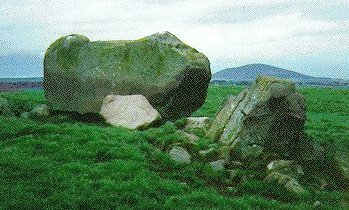 About three miles to the south-west near where the railway bridge crosses the B9022 road to Huntly, are the remnants of a stone circle at Arnhill, high above the road in a field to the west. Parking may be tricky here; ask permission at the farm to go up to the circle. Little is left except the south facing recumbent stone, fallen reddish stones, central cairn material, plus field clearance stones. The adjacent Ironstone is said to ring when struck with metal. I tried but no music came out.